If you would like to run a tattoo contest temporarily in a business premise, you can ask for the permission to use the business premise to conduct the operation. Use the following form to seek consent. 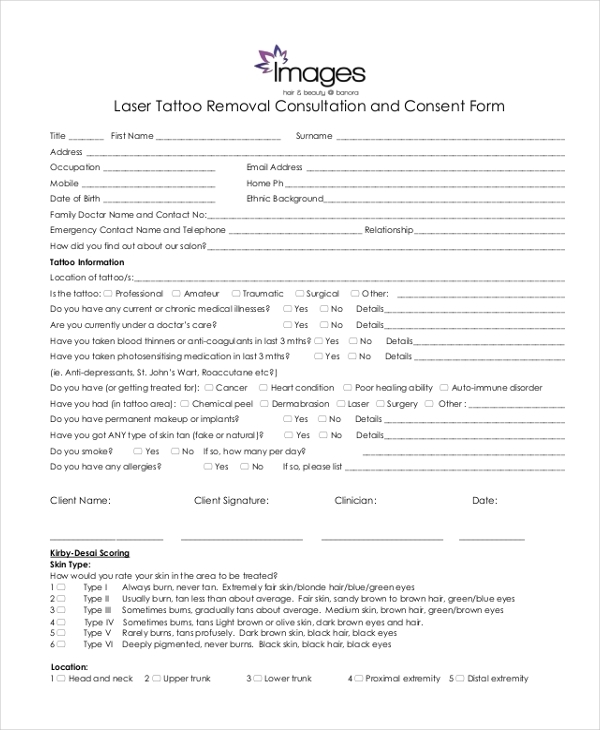 If a client has approached you for tattoo removal, it would be great to request for the removal consent. The reason is asking for the consent is to have the assurance that the patient in question accepts the procedure as is. Parents need to give consent before their minors can get tattoos. 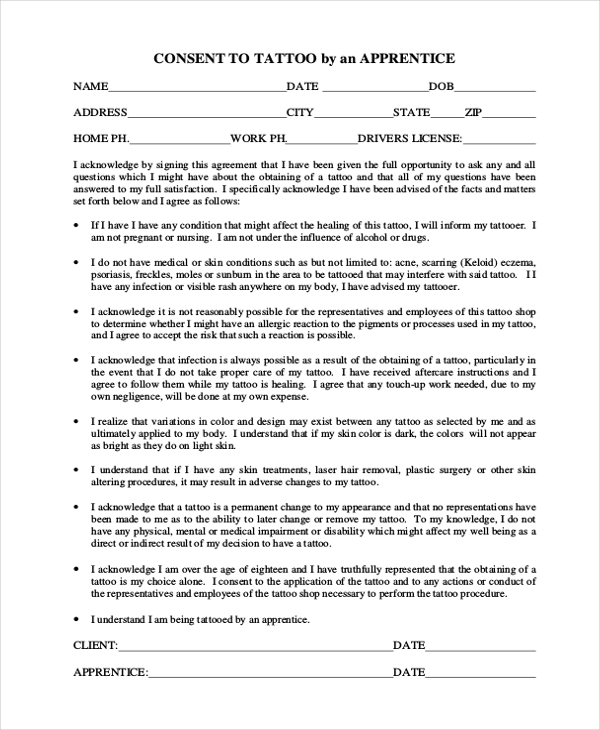 The only best way to give a tattoo a go ahead is to perform the operation and fill this form as approval that you accept the procedure. Laser tattoo removal is always a complex and expensive procedure, and unless an operator has your consent, they are unlikely to conduct the procedure. Use this form to give your consent. Before you can pay for tattooing, the artists they will ask whether you are fine with the cosmetic procedure. 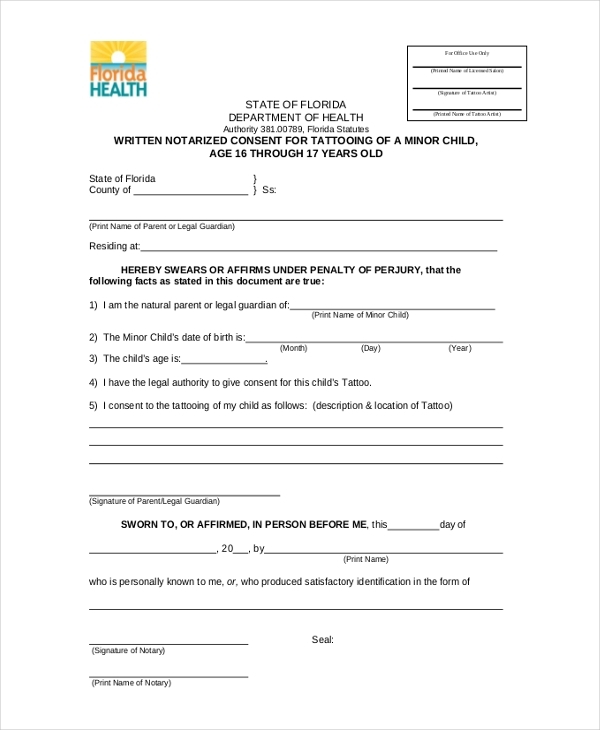 Usually, you have to give your consent by filling a form, so you can fill this form and be with it to the tattooing premise. If you need a permanent tattoo, you need to give the artist the permission to perform the procedure on your skin. 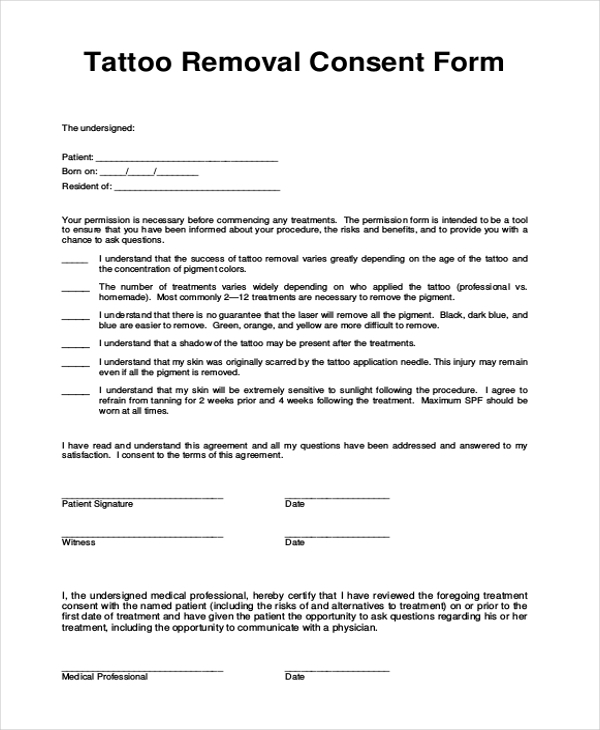 Your consent recognizes you to understand that the tattoo will be permanent and not removable in the future. The process of piercing your skin is often a painful one. 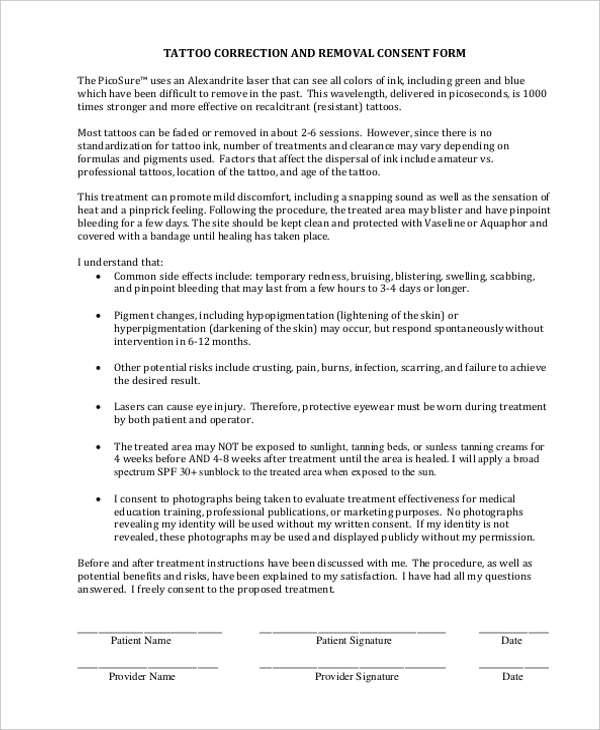 If you are sure you are comfortable with the procedure, including the potential consequences of the procedure, you can use this form to give a tattoo artist the go-ahead to draw a tattoo on you. Before minors can go ahead and start tattoo project in an event, it would be a good idea to ask their parents for consent first. 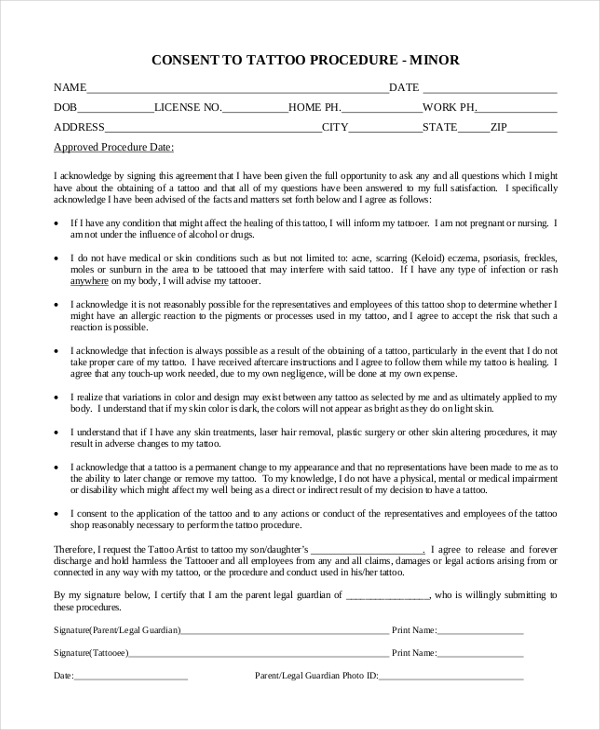 If parents are fine with the practice, then they will fill this sample consent form. If you would like to start a tattoo apprentice, it would be best to seek the consent of relevant party before you start operating the business. 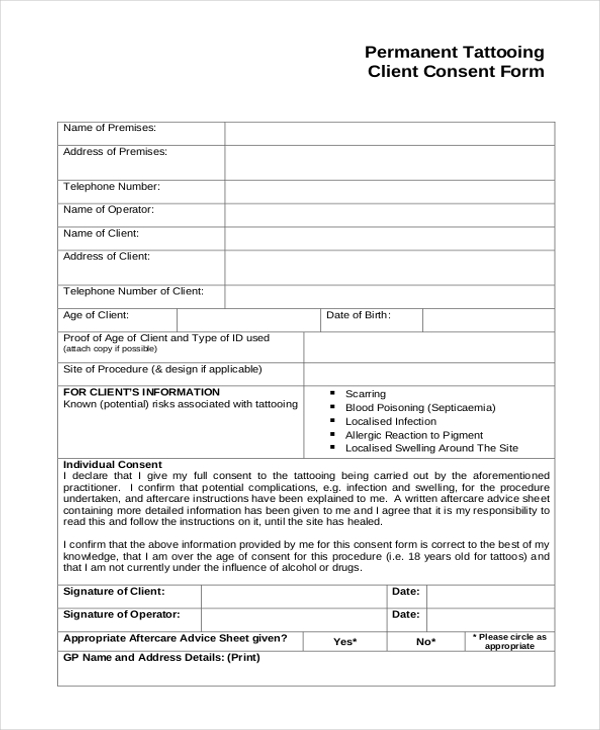 To make your process easier, you can ask for consent using this form. Giving your consent mean that you are ready for the possible after-effects and consequences of tattooing. It means that you are ready for the procedure, even if both of you have no idea how long the process is likely to take. Giving your consent means you are willing and able to carry the tattoo around without regretting why the artist ever did that to you.